You may have noticed that recently released NYSE margin debt data showed us a month over month decline. Taken as a singular data point, pretty darn meaningless. But set against the context of QE III and the current 2009 equity market cycle to date, its worthy of at least recognition and discussion. Why? In prior cycles, the time to have been very careful regarding equities has been when margin debt achieved a momentum peak and subsequent reversal. Historically this been “the” momentum peak sign coinciding with a least a near term equity market peak of meaning. Will the experience of prior cycles be so again in the current environment? I wish I knew the correct answer, but for now I’m hoping asking the right questions provides us a watch point. In terms of momentum, if you will, the year over year rate of change in margin debt clocked in at 35% as of May. It’s a darn good bet the June numbers will show a noticeable decline and the year-over-year rate of change may fall. Could May be the rate of change peak in margin debt expansion for some time? We’ll see, but we need to realize that since 2009, there has only been one other month to see the annual rate of change in margin debt exceed 35%, and that was April of 2010. Of course the reason we saw a 42% annual growth number in that month was the fact that the 12 month comp was April of 2009 – just two months after a 5+ year low in nominal dollar margin debt outstanding. To put things into visual perspective, have a peek at the following chart. You can see in the bottom clip exactly what I’m talking about in the current cycle. The 12 month rate of change in margin debt was only higher in this cycle in 2010. Moreover, as you look at the longer term history and rate of change rhythm of margin debt outstanding, it’s really only the highly speculative margin debt peaks of late 1999/early 2000 and 2007 that experienced higher rate of change numbers. As you know, each of these occurrences was ultimately followed by chopping equity values in aggregate in half. As a last comment, exclusive of the ’00 and ’07 margin debt rate of change peaks, since 2000 every time the annual rate of change in margin debt achieved the 35% number or darn close to it, three months out the S&P price only was down. 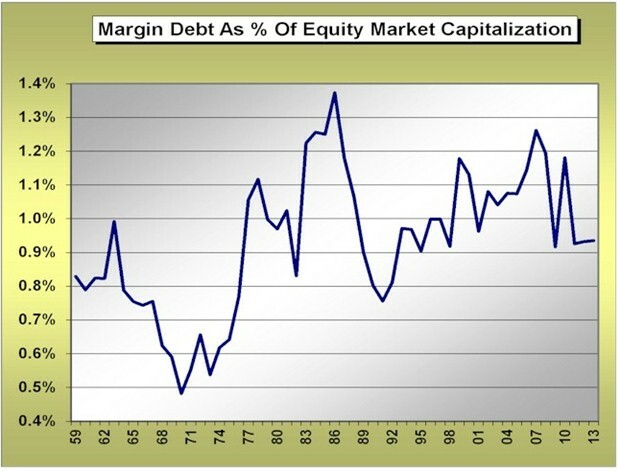 In May of 2011, the annual rate of change in margin debt out kissed 34%. Three months later the S&P had lost 16% of its value. In March of 2010 we again touched 35% (one month later was the April 42% number). Three months after the March occurrence, the S&P was down 12%. This is the experience of the current cycle from 2009 to present. Prior occurrences in April of 2007 and February of 2004 saw the S&P lose 2% three months subsequent. Whether we’ve seen the peak in margin debt or peak rate of change is still a question that will only be answered by tomorrow’s data. But I think it is safe to say that we’re in rarified air right here. If the character of margin debt expansion is not the embodiment of “animal spirits”, if you will, then what is? The exact animal spirits Mr. Bernanke has been trying so hard to evoke with subsequent iterations of QE. One more comment. Let’s look at the history of margin debt outstanding relative to the total value of the equity market. Now this does not look too bad, right? We’re nowhere even near historical high water marks. Unfortunately when it comes to changing margin debt levels and how they impact financial markets it’s a case of “Bernanke’s Dilemma” – stock versus flow. From my perspective, it’s all about the rate of change in margin debt outstanding, the character of the flow, not absolute nominal dollar margin debt outstanding itself. Flow impacts the forward rhythm of markets. Given the behavior of the macro financial markets lately, they seem to have exactly the same flow versus stock perception regarding QE. For now, we have a few margin debt data points of interest. We’ve hit rate of change rarified air for margin debt in the current cycle. For now we’ve hit a nominal dollar margin debt high for the current cycle followed by an initial reversal. Both historical character points worthy of investor attention. 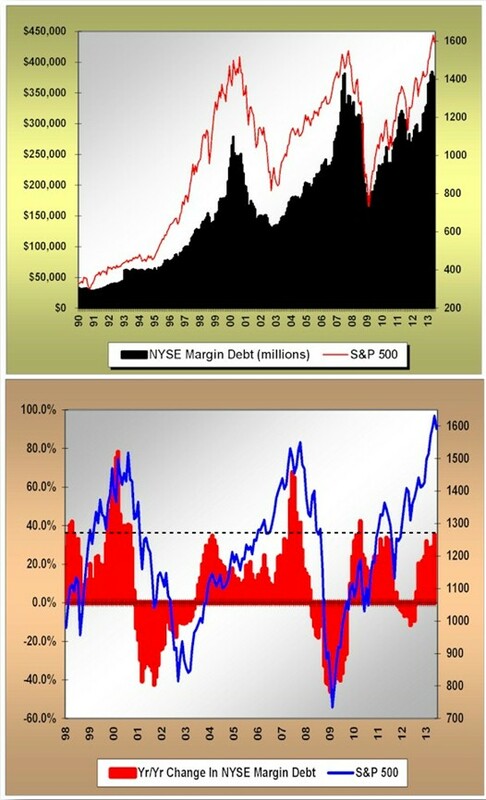 Is it just a pause prior to ever higher levels of margin debt outstanding being achieved? Or does this mark a nominal dollar and rate of change demarcation line of potential increased price volatility for equities given the character of margin debt “animal spirits” already expressed? Stay tuned, but be aware that rhythm and pacing of the current 2009 to present cycle is speaking about the potential for a bumpy summer. Investors are painfully aware of Fed Chairman Bernanke’s comments in mid-June on timing the end of Quantitative Easing (QE III). Can it really be that, after imposing a flattened rate environment where obtaining even modest yield is only achievable by seriously increasing investment risk, Bernanke and Co. would literally yank the rug right out from under investors? Investors who have been playing the game by the Chairman’s rules? The quick answer to that question came by double digit drops in yield oriented asset classes such as utilities and MLP’s, as well as record weekly bond fund outflows. Those merry pranksters at the Fed, they’re always good for a belly laugh, right? What will they think of next? The Chairman told us that the Fed’s assessment of the US economic landscape has improved. The Fed now expects a 2.6% GDP number for 2013. That’s well ahead of current consensus. As you’ll remember, stated Fed objectives with QE III are improvement in the labor market, a drop in the headline unemployment rate, and a “better” tone to the US economy (without benchmark or quantification in terms of what specifically a “better tone” means). Back in September 2012 when QE III was initiated, the Fed said that they would assess the underlying character of the US labor market in addition to wanting to achieve a headline unemployment rate number of 6.5%. Mr. Bernanke tells us the Fed believes the US labor market has improved. So, in the spirit of cooperation, I thought we’d do a bit of the Fed’s work for them – going into labor, if you will. Is it really true that the US labor market has improved? If so, by what metrics and historical context? By the Fed’s objectives, does current US labor market character justify a tapering of bond purchases by the Fed? Please do not mind the fact that the Fed has never once drawn an academic – or any other – linkage between their buying of US Treasuries and mortgage backed securities (MBS), and actual jobs growth. So, just what does labor market “improvement” look like now that so pleases the Fed? Let’s start with a quick review of where we’ve been over the last 12 months, ten of which fall under the magical QE III umbrella. The following chart chronicles the percentage job growth as per the major labor market employment classifications. We’re four years into the current economic expansion cycle. Yet in the last year, the largest percentage gains in jobs have been in Temporary positions. Historically, the largest gains in temp positions occur at the beginning of prior economic expansion cycles, not four years into the cycle. That growth in temp jobs stands head and shoulders above more permanent classifications speaks to the continuing tentativeness of employers. Next up in terms of job growth percentage gains are Food Service and Beverage (bars and restaurants) as well as Leisure and Hospitality (hotels). Like Temporary, these job classifications have historically represented lower wage demographic and limited benefits. Alternatively, where historically we’d look for strong gains in job classifications such as Construction, Manufacturing and Finance/Insurance, those sectors have registered tepid at best percentage growth in the current cycle and over the prior 12 months specifically. (As a quick tangent, year over year gains in total US wages have been bumping along historical lows in the last year.) What you see above helps explain this current cycle phenomenon. 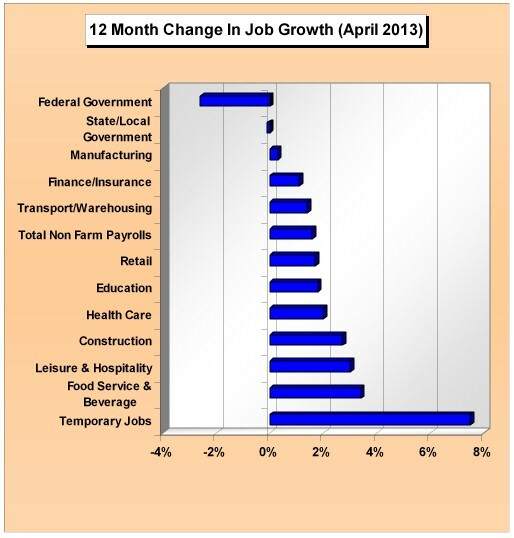 This is the labor market recovery that Mr. Bernanke and his FOMC compadres point to with confidence? As a bit of a twist over the last 12 months, it is clear that US employers have been anticipating implementation of the many Affordable Care Act (Obamacare) rules and regulations. This has definitely affected the character of today’s US labor market. In March we saw the 12 month rate of change in US average hours worked fall into the deepest negative territory since 2010. 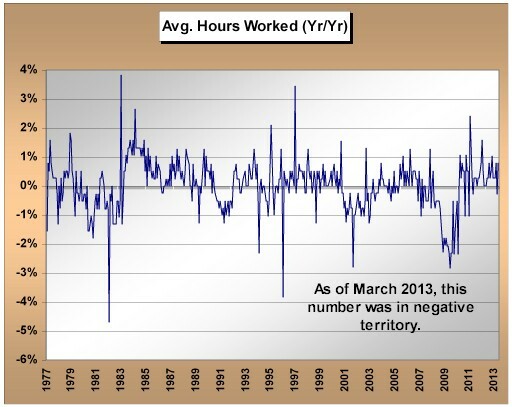 Economic expansions are usually characterized by expanding hours worked. The obvious explanation for this is employers’ shift to a greater part time labor force, driven by their desire to blunt the increased cost of health care insurance caused by the Affordable Care Act. While a rational response on the part of employers, this isn’t so wonderful for employees or the economy. This message by and actual behavior on the part of employers is only reinforced by what you see below. 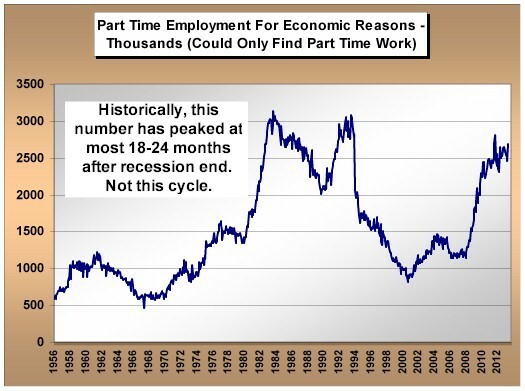 As of April 2013, the number of folks working part time due to the fact that they could not find full time work has risen to almost the highest number in the current cycle (except for a brief spike in 2011). What is most important in the above graph is that in prior cycles, this employment subset peaked 18-24 months post-recession. But not this time. Except for the brief spike in 2011, we’re still setting new highs four years after the Great Recession officially concluded. Is an increasingly part time US labor force what the Fed envisioned as character point success when they presented QE III as the new remedy for US labor market lethargy? One last metric deserves your consideration. 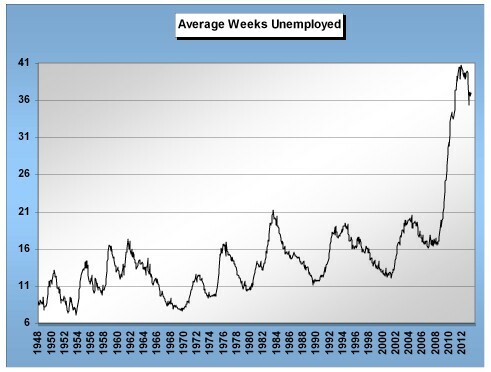 Over the last four decades, the average weeks of unemployment for the unemployed in each down cycle peaked between 17 and 21 weeks. Naturally this was seen at the worst of each recession experience (and which happened to occur post official recession end in each cycle). As the chart below depicts, we remain at a level roughly double this historical norm – this is new for us. If this does not suggest some structural unemployment in the current cycle, I’m Paul Volcker. No doubt the unprecedented extension of unemployment benefits in the current cycle has encouraged this, since returning to a part time job is less “lucrative” than simply continuing to collect unemployment benefits. Again, this is the character of labor market recovery the Fed has been hoping for in order to scale back QE III? Is the world coming to an end for the US labor market? Of course not. However, it’s clear that headline nominal job gains do not tell the whole story of the tone of the current US labor market. The Fed knows this. They also know full well that it’s very tough to demonstrate a linkage between their buying of Treasuries and MBS, and actual jobs growth. Is this why we’ve never once seen a Fed member attempt this academic high wire act? I believe there’s a subplot to Bernanke’s recent comments. Remember, in this cycle the Fed can’t raise rates as in prior cycles to cool down asset classes without derailing a tepid recovery. Thus, the Fed only has its megaphone. Since mid-May, a number of Fed members expressed their somber views on QE III, the need to scale back, etc. That didn’t do much, and minutes prior to Bernanke’s comments, the S&P was less than 2% away from all-time highs with oil closer to $100 per barrel. Markets were not “listening” to them. So was it simply time to bring out the big gun and cool off asset markets running well ahead of either earnings or macroeconomic expansion? Since it seems all but official that Bernanke won’t be with the Fed come January, does this enable Bernanke to help lay the groundwork for future Fed policy by playing the “bad cop” role? Helping to foreshadow a policy change we all know must come at some point without laying that decision completely at the foot of the next Fed Chair? We also know that at current rates of purchase, Fed buying has accounted for approximately 80% of all newly issued Treasuries. With the very meaningful acceleration of capital gains and personal income into the fourth quarter of 2012, government tax receipts spiked in the first quarter of this year, and government borrowing has fallen. Unless the Fed tapers a bit later this year, their current rate of Treasury purchases could exceed 100% of newly issued Federal debt. Is this a circumstance the Fed wishes to avoid and can only be accomplished by some measure of tapering, even if temporary? Lastly, one overriding issue we must not forget is that, despite all the talk concerning QE, labor markets and broader US economy, under QE III the Fed is setting the cost of capital for the Federal government. It’s exactly the same for Japan and Europe right now. Remember, these governments have all borrowed heavily and have not yet begun the process of balance sheet deleveraging. Every 1% increase in interest rates adds about $175 billion to US debt interest costs alone. Will the Fed really turn a blind eye to US interest rates and chance a large increase in Federal interest costs on debt? As we’ve seen above, it seems very tough to suggest that true improvement in the US labor market is driving the Fed. The Fed is juggling a lot of disparate “agenda” balls in the air with its QE policy – the US labor market is but one. We’ve heard talk in the past from Fed members about an ultimate winding down of QE policy. But I submit to you that the LAST thing central bankers will do is reverse the present course of monetary policy either quickly or abruptly. Why? Because improvement in the US labor market has been lacking, the Federal government has not yet begun a sincere plan of debt reduction, and inflationary pressures remain modest to this day. Change will ultimately come, but very slowly at best. Bernanke and the Fed’s hands are not resting on a light switch, but rather a dimmer switch. To suggest gold is a controversial asset is not bold. For those watching long term, you know gold rose over 300% in the last decade before it even gained mainstream attention, let alone acceptance by many as an investment vehicle. Gold has been a medium of economic exchange for centuries across all geographies on planet Earth. This “function” blurred meaningfully following the closure of the gold window in the US by Nixon in the early 1970’s. So which is the proper time frame to judge the legitimacy and “function” of gold, including its function as an investment – centuries of human economic history or what has transpired over the last forty years? Investors are usually most concerned with what is occurring in markets right now – today, this week, this month, this year. For many caught in the institutional performance rat race, there often is no tomorrow, only today. Short attention span theater is the norm. And when it comes to gold as an investment, today, this week, this month and this year have not been too heartwarming as price has corrected meaningfully after 12 straight up years based on annual closing prices. For those in the gold bull camp, there must be at least some tearing given unlimited money printing by the globe’s largest central banks. Should this not have been the Promised Land for the long term gold bulls as keynote currencies globally are openly and actively being debased? Gold aficionados could not have asked for a script any better than what is playing out right before our eyes! So what’s wrong with gold? We must remember that investors as a crowd can be a very fickle bunch, especially over the short term. Investment attention shifts also between various investment drivers. For example, most often investors focus on company specific earnings when it comes to setting equity prices. But we know that lately in the US market, earnings and macroeconomic fundamentals are not the keynote drivers of equity prices. Rather, as I’ve written this year, the weight and movement of global capital have been the key drivers of this year’s investment outcomes. I believe the central bankers have finally gone too far setting global capital in motion, and thus scared Yen and Euro capital are migrating to the perceived safety that is the US dollar and US equities. This migration is supporting prices in the absence of meaningful earnings and/or revenue advances. This isn’t right or wrong, but worth remembering since no one metric drives asset prices at all times. And such is also the case with gold. Some investors have purchased gold believing the US and the globe must return to some type of a monetary gold standard in response to the current ad hoc and unprecedented monetary policies of global central banks. Personally I assign zero probability to this as it would entail quick economic depression for so many economies. But that does not mean gold does not have a purpose. Others have purchased gold convinced the US and other major economies are soon to embark on an inflationary spiral, with hyperinflation a possibility due to the magnitude of printed money in the current cycle. So far, that inflationary cycle has remained elusive as deflationary forces inherent in a debt deleveraging cycle have offset central banker otherwise inflationary actions. But that does not mean gold does not have a purpose. Others have purchased gold, especially in the post 2008 period, as a “tail risk” hedge against broader financial markets. As you may remember from your college statistics class, the “tails” of the normal distribution curve, or bell curve, are areas of very low probability outcomes. In the financial markets, an example of a “tail risk” is a market crash. It’s just not something that happens frequently (although when one does occur, it’s not easily forgotten). After what occurred in the equity and credit markets from mid-2007 through early 2009, it’s only a natural that investors then incorporated some type of tail risk protection into portfolios. Now that equity and credit markets are back to all-time highs, with promises by the world’s top central banks to do “whatever it takes” by printing money to support economies and financial markets, the perception is that “tail risk” is much less of a threat than over the prior four years – or perhaps not a threat at all. Hence, there is the perception of a lessened need for gold in portfolios as financial disaster insurance. But that does not mean that gold does not have a purpose. And still others have purchased gold as a hedge against systemic risk. We can all remember clearly the final days of 2008 and early days of 2009. Questions regarding the viability of the US banking system were very real. Fast forward to the present and the Fed has largely engineered the recapitalization of the US banking system via bond purchases, allowing the banks to earn an interest spread between the cost and use of their funds, clearly at the expense of depositors. For now, US banking/financial system systemic risk is off the table in the US. But that does not mean gold does not have a purpose. So, are these the answers to the question, “What’s wrong with gold”? And if so, is it true that the gold bull market begun at the dawn of the last decade is over? We need to remember that everything talked about above can be considered an abnormal, or “crisis” type of event (tail risk, systemic risk, etc.). Think back to the late 1970’s when US inflation was in double digit territory and gold was soaring. Investors at the time had never seen inflation rates like that. A crisis due to generational highs in inflationary expectations and real price pressures? Gold responded. Was Nixon taking the US off the gold standard in the early 1970’s a crisis? It may not have been seen as one at the time, but what followed was a drumbeat of successive country currency crises over the ensuing decade’s right up to the present. Gold responded. In my mind, what’s wrong with gold is first that investor perceptions of a crisis probability is now low. Consider that this is a perception susceptible to change. The financial markets are characterized by changing investor “focal points”, or perceptions, over time. I’m convinced change in risk perception is short term, and has occurred due to unprecedented global central bank actions over the last 6-9 months. The consensus is that so long as the global central bankers are printing unprecedented amounts of money, the financial markets, banking systems and general economies are safe. So where does this leave gold? My suggestion is that looking forward gold will now be much more of a barometer concerning confidence in central bank and political decision making – that’s its current purpose. Prior to this year’s gold price correction, I sold half of the gold exposure in client accounts after holding positions for over a decade, in part due to the short term perceptual issues I discussed above. I remain convinced financial markets in 2013 are being driven by the weight and movement of global capital, specifically scared Yen and Euro capital moving into dollar denominated assets. When this occurs, the dollar strengths and the Euro and the Yen weaken. The rise in the Japanese Nikkei this year has much more to do with underweight global institutional investors jumping in. Domestic Japanese investors continue for now to invest outside of Japan. Global currency movements can also impact the price of gold over the short term. Historically, gold prices have moved inversely with the dollar. As global capital concentrates in the US dollar, the dollar rises in value. Again, history tells us a rising dollar is not a gold friendly environment, another part of the rationale for lightening up now. Secondly, headline inflationary stats have been receding. Historically, gold has performed very well in a “negative real interest rate” environment. In English, that means interest rates below the rate of inflation. This year interest rates have held steady while short term inflation rates have fallen – in other words “real” interest rates have actually become “less negative”. Very short term, that’s less of a support for gold prices. Lastly, it was simply the realization that in any long term asset class bull market, assets need time to rest and time to consolidate before again moving higher. It’s simply time for gold to rest. So, is the more than decade long bull market in gold over? Although it’s mandatory to monitor as we move ahead, I’d suggest to you it’s not over by a long shot. Why? The gold bull market being over would mean that central bank and political decision making ahead will be mistake free. That they’ll lead us all to the land of sustainable economic expansion with nary a bump in the road, and all prior issues related to global excess debt balances will be magically resolved to everyone’s benefit. If I truly believed that, I would have sold every ounce of gold we owned and be personally short gold. I’ve done neither, nor do I expect to any time soon. What lies ahead that could potentially break investor confidence in central bankers/politicians, leading to a renewed attraction to gold as being a meaningful asset within a diversified portfolio? 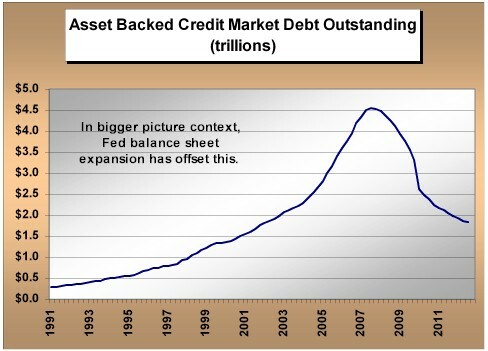 1)	The US Fed has been printing money/expanding their balance sheet since early 2009. Since then they have printed close to $2.5 trillion. Since 2007, central bankers collectively have printed over $11 trillion. Unfortunately these Herculean efforts have not driven large global economies back to GDP trend growth. Growth rates in the current cycle are running at half the average of 1940-2008. Will printing another $1 trillion annually change this? How will this differ from the first $2.5 trillion of monetary expansion? And if economies do not reaccelerate, then what? 2)	The Japanese are now intent on printing money at a rate twice that of the US Fed. This after more than two decades of economic deflationary pressure despite many prior money printing exercises by the Bank of Japan. Will the Japanese economy positively respond with this recent and most forceful monetary iteration? Moreover, in a current world of very slow to no growth in aggregate demand, will economic success in Japan simply be borrowing growth from another country or series of countries, in essence a zero sum effect for the global economy? If so, then what do central bankers and politicians do next? 3)	So far, major developed economies have chosen to print money as a prescription for slow economic growth. What has been avoided is meaningful systemic reform accompanying the remarkable monetary stimulus. The need for reform has not disappeared, only been deferred. In the US this includes honestly and proactively addressing debt, deficit and entitlement expansion. All meaningful focal points of real reform have eluded Europe, the US and Japan. A failure to accomplish true economic infrastructure reform will mean the global money printing is for naught. Will this essential reform be accomplished and when will it start in earnest? Put otherwise, if central banks print historic amounts of money, yet politicians fail to enact needed reforms, which will alienate part or all of their political voter base – then what? Remember, financial markets are not driven by a consistent and unchanging set of factors over time. Investor focal points change. For now the key focal point upholding investor confidence is the unprecedented magnitude with which global central banks are printing money, accompanied by promises to do more. But the core issues mentioned above have not magically disappeared. It’s in the reality of structural reforms where the real economic rubber meets the road. For now, global central bankers are being given “the benefit of the doubt” that all will end well. The thinking is that nothing can go wrong as long as money printing is in force. But for gold, that’s only half the equation. We all know money cannot be printed indefinitely (especially in the magnitudes we see today) without adverse consequences to both financial markets and real economies. The real risk ahead is that reforms addressing debt, deficits, entitlements, currency infrastructure, and systemic risks will never occur. These require strong and decisive political thinking that translates into direct action. That’s where the real risk comes into play. IF unprecedented money printing is not accompanied by successful and sustainable economic reform in the major developed economies over the next 12-18 months, gold will respond. That’s the investment thesis for gold as we look over the next few years. How far could the price of gold fall before the current correction reverses? As always, it’s anyone’s guess and depends heavily on supply and demand balances. Although global demand for physical gold has remained incredibly strong, it’s the paper markets where we see the weakness. Gold near 1100 is not out of the question before this correction ends. But given the politically tenuous prospect for global economic reforms accompanying monetary policy across the planet, we may be looking at the final third of the secular gold bull market perhaps beginning sometime later this year or into 2014. The central bankers and politicians have so far inspired short term confidence in the financial asset markets. It’s now up to these politicians and central bankers to address the tough reform issues. If they do not, gold will have a purpose. Before taking even one step further, I’ll tell you right up front that this is more of a “for fun” discussion than not. For many a moon I have followed a number of sentiment surveys that I believe can be quite helpful. Not investor sentiment, although there are plenty of them, but rather the sentiment of folks who sit on the front lines of actual business operations, and most importantly corporate earnings. I am referring to CEO and CFO surveys. If I had to pick just one, it would be the Conference Board CEO business confidence survey that unfortunately only hits the tape quarterly. Why? 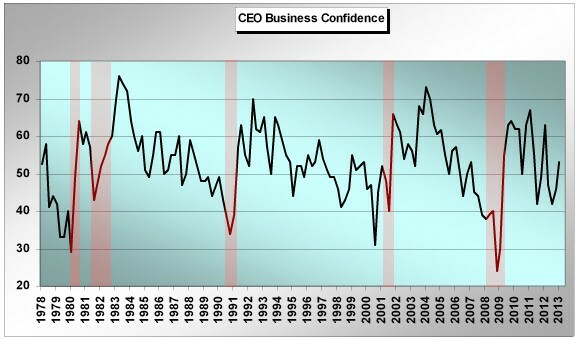 Let’s have a look at the following chart that is the long term history of the CEO Business Confidence survey. For good measure I’ve marked each official US recession since the inception of this survey. Can you see why it’s one of my favorites? Although no one in this wonderful world is clairvoyant, inclusive of every central banker on planet Earth despite what you may have heard, the CEO’s having contributed to this survey over time have had an absolutely remarkable record of calling turns in the economy. And wildly enough, almost exactly on the money. Very important for us as investors given that the financial markets also anticipate. 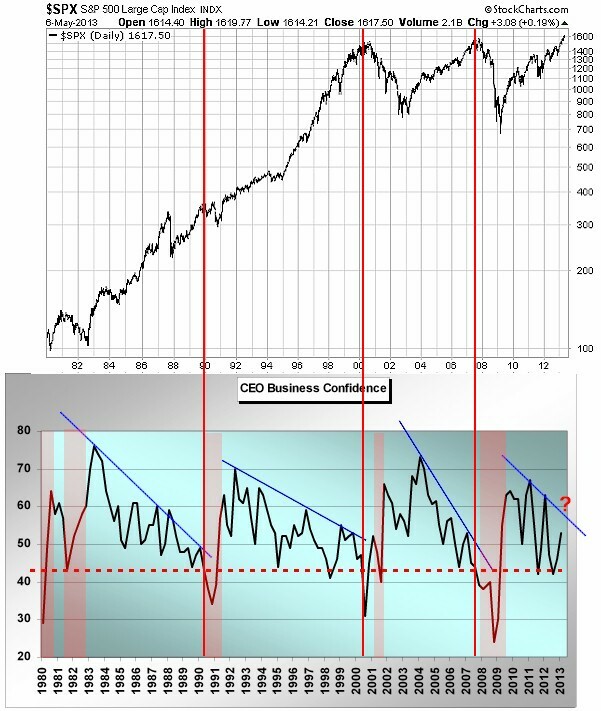 You can see looking at the chart that CEO business confidence bottomed in each US recessionary period prior to the end of the official recession itself – exactly as equities usually bottom and begin to rally prior to the economic bottom in each recession. The experience in 2001 was a bit different, but you may remember years later that recession (although still “on the books”) was essentially revised away as there were no two down GDP quarters officially. Secondly the 2008-2009 experience was also a bit different. Although CEO confidence bottomed before 2009 even began, downside anticipation was a bit less than in prior cycles. Personally I attribute this to the fact that a credit cycle implosion dragged the economy down with it, not the other way around as is usually the case in “normal” economic cycles. Nonetheless, CEO confidence bottomed well before equities in that 2008-2009 cycle. Had we “listened” to the CEO’s, we would have known the 2009 equity bottom was a buy. What’s one lesson here? Moves below 40 on the CEO business confidence survey have in the past signaled a near term official recessionary outcome. There are no exceptions to this over the history of the survey. Secondly, the confidence survey has bottomed in each economic cycle at 35 or below. The key is to wait for a reversal off the bottom before diving into the deep end of the US equity buying pool. The move in the survey back above 40 after a 35 or lower bottom in each cycle has been achieved could be considered a prudent trading tool amongst the greater analytical toolbox of life. Again, 2001 is a bit of an exception probably due to the 9/11 event. Wonderful. We can put this one in the tool box for the next equity and economic cycle downturn. But what about now and the remainder of the current equity and economic cycle? It turns out that trying to predict meaningful equity market and real economy contractions using the CEO business confidence data is a bit trickier, but maybe not impossible. Have a look at the following chart I’ve marked up more than a good bit. Let me explain. It’s not hard to understand that out of the depths of each official US recession, CEO business confidence has rocketed higher into the beginning of each economic expansion. The worst is over. Better days lie ahead. For investors as well as corporate exec’s, it’s a much happier time than what has already played out over the recent past. And in many cases we see CEO confidence run to or near all-time highs for the next economic expansion cycle early on in the cycle. Usually a year or so into the expansion cycle sees the pinnacle of CEO confidence for the entire cycle. From there on out CEOs have remained positive on the economy (above 50), but rhythmically less so as each cycle ages. In fact what is a more than apparent pattern in each economic expansion cycle is a series of “lower highs” for CEO confidence itself, ultimately leading to the next business cycle contraction. I’ve marked these clearly with the descending blue lines in each cycle. Although we have a whopping three data points/patterns of historical experience when trying to anticipate the downside using this survey, each cycle iteration was extremely similar. As each economic/market cycle was nearing its conclusion, the prescient CEOs became a good bit more gloomy. In each cycle we saw a move to the approximate 42-43 level (the red dotted line), one last spike up in confidence that went no higher than the 50-55 range, and then the final move below 40 that signaled the expansion was over. 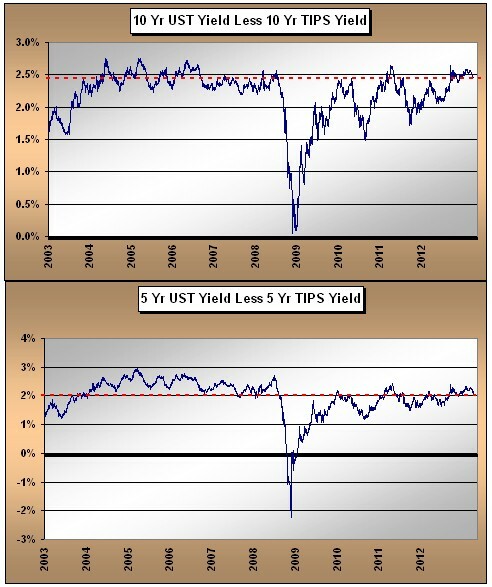 As investors, we need to realize that these were important topping periods for equities. Why am I bringing all of this up now? We’ve already had our move to the 42ish range for this cycle. We’ve put in the series of declining highs. In fact the most recent dip to 42 was the second time the survey hit the low 40’s in this cycle (once in 2011 and once in 2012). Are we getting a “double” due to unprecedented QE? We’re cycling back up right now based on the most recent survey numbers (1Q 2013). So, IF historical patterns and their implications for both the real economy and financial markets hold true, we need to watch these numbers like a hawk ahead. If we can break the series of declining highs to the upside, the CEOs will be telling us this already extended cycle extends further. But on the chance we see CEO confidence break back down and potentially arrive at 40 or below, I would personally consider it a very serious warning, unprecedented central banker actions or otherwise. We’re not there yet and may never be, for all I know. The unfortunate part of the equation is that we will not again see these CEO confidence survey results until July. To be honest I believe the length between cycle results actually heightens their meaning. I told you at the outset this would be a bit of a for what it’s worth discussion. Nothing actionable right here and right now in terms of trying to make a macro call. Rather, I’m just trying to anticipate the relatively consistent rhythm of human behavior as we move into the summer months. I know real fundamentals and earnings trends have “meant less” to investors so far in 2013 relative to what has been the meaningful impact of the weight and movement of global capital. We’ve been here before. And of course the one absolute guarantee of the financial markets? Everything changes. Count on it. Every once in a while I find it very helpful to just sit back and look at charts that essentially have no titling. At least for myself, it’s often an easy way to “see” trends, or more importantly change in trends, without having my own personal bias of the moment get in the way of trying to interpret what the chart(s) may be telling us. Guess what? Now it’s your turn. Here you go. Clearly what we are looking at above are not stock charts as we are not looking at price, but rather percentages, or more precisely percentage contributions as I’ll explain in one minute. First, as you know, in the middle of last week we were treated to the ISM number for April. Weaker than most would have liked to have seen, but not wildly surprising given recent and obvious weakness in the Chicago and Milwaukee manufacturing numbers. The number came in at 50.7%, not too far from the mainstream vision of the “dividing line” at 50, which theoretically represents the demarcation line between economic expansions versus contraction. A reading below the current has only been seen in 4 months out of the total number of months since the current economic recovery began in the summer of 2009 (two of those came recently in November and December of last year). I will not drag you through an extensive historical retrospective, but the fact is that 50 is not the correct “economic demarcation line” number. If one goes back and looks at all the macroeconomic contractions or recessions in the US historically, ISM numbers in the mid-40’s have characterized such periods. We’ve had plenty of brushes with 50 and numbers just below without a subsequent recession over time. So to suggest that a drop to or slightly under 50 is a major recession warning is incorrect…for now. Although many have given up on US manufacturing having watched the offshoring of so much former US manufacturing in the prior decade, the fact is that manufacturing has taken on relatively heightened importance in the current cycle for a number of reasons. Okay, Chart #1 you were looking at above is US personal consumption of “services” as a percentage of total US GDP. Remember, we export very few “services” as the bulk of services are “consumed” stateside. Very telling that US consumption of services as a percentage of GDP has been falling consistently over the 2009 to present period. As you’ve probably guessed by now, Chart #2 is US manufacturing as a percentage of GDP. If these two charts were indeed stock charts, which is the potential buy and which is the potential sell in the current cycle? Without question the US manufacturing sector has been an important sector contributor to overall US economic health in the current cycle and it’s really no surprise as to why. Manufacturing in the US has benefitted nicely from the flood of foreign stimulus unleashed over the last five years by Asia, Europe, South America, etc. Since we do not export services, there has been no such foreign sourced benefit to the service sector. Additionally, the US service sector has had to weather a domestic household deleveraging environment and very sluggish payroll and wage growth environment. 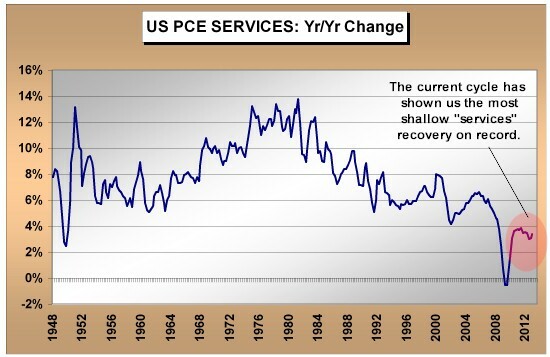 Most probably do not realize this, but the year over year change in the US service sector (as measured by the PCE numbers) in the current cycle is the slowest over the Fed sponsored recorded history of US GDP stretching back into the late 1940’s. To keep myself honest more than not, the numbers above are the actual nominal numbers as opposed to the real, or inflation adjusted numbers. 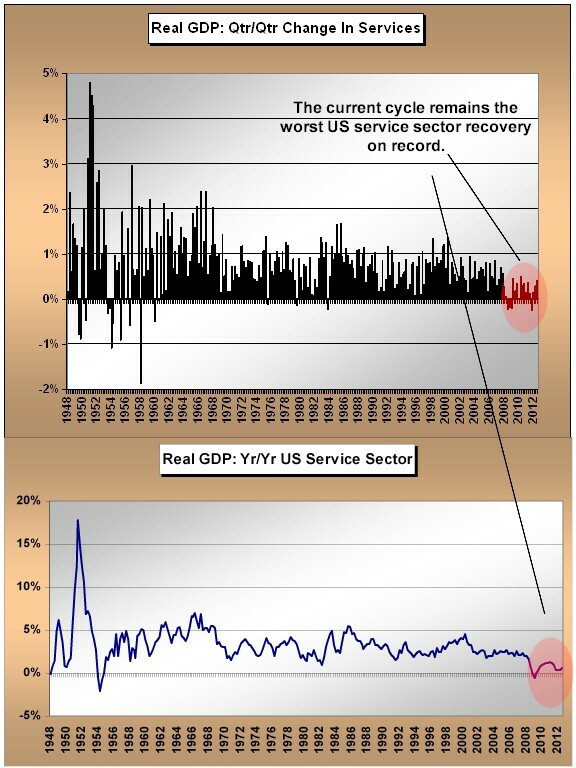 But even adjusting for inflation, total US service sector recovery in the current cycle has no comparison with prior cycles. Talk about not being able to achieve “escape velocity”, the US service sector in the current cycle is what that characterization is all about. So in one sense, the relationships you see do not speak to a dramatic US manufacturing recovery, but more of a default environment where manufacturing has done better than services as services are the anomalistic weak standout relative to historical cycles. Just why is this important? Absent meaningful US payroll and wage expansion, it’s a darn good bet the US service sector will continue to remain in tepid water at best. And that puts a big spotlight on US manufacturing looking into the back half of this year and beyond. It should be very common wisdom right now that the US will experience lackluster economic growth in 2Q and 3Q. The initial fallout from sequestration will be felt front and center during those two quarters. But very importantly, consensus thinking on the Street is that the US economy will pick up steam in the back half of the year and into 2014. Important to investment decision making, we see exactly the same pattern with consensus expected corporate earnings right now. Tepid near term growth, but a huge acceleration into the latter part of the year on into 2014. The hockey stick effect is alive and well, as is pretty much always the case anyway. Although I may not be connecting all the dots, it seems reasonable to assume that the non-services portion of the US economy will be very important to the expectation that earnings are about to rocket higher into the back half or 2013 and into 2014. If the train of logic here is even half right, then it leaves me with a very large, and for now unanswered question. 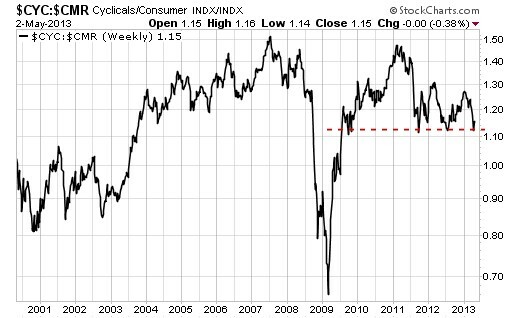 Why are cyclical stocks having such a tough time relative to defensive and consumer oriented equities? Yes, I know all about the “hunt for yield” thesis. Unfortunately, so many defensive and yield oriented equity sectors exhibit valuation metrics of the moment at multi-decade highs that forward investment risk is meaningful. Thanks, Mr. Bernanke, for forcing those who can least afford to accept investment risk (those dependent on investment income) to pay decades high top valuations to achieve very low nominal yields. If you ask me, it’s a very overcrowded trade and one that may end very badly for retail investors myopically focus on stated yields. The following chart is a look at the Morgan Stanley cyclical stock index versus the Morgan consumer index. We’re resting at what appears quite the important juncture of the moment, now aren’t we? The actual economic numbers tell us manufacturing is important, implicitly suggesting cyclical stocks are a key watch point. It is absolutely clear that on a relative basis, cyclical stocks peaked in 2011 relative to their consumer brethren, despite the fact that actual US manufacturing as a percentage of GDP has increased since then while services consumption relative to GDP has declined. Hopefully without trying to force fit relationships, there are two other assets whose charts look a heck of a lot like the one above from 2010 to present. First, without the titles. With the prices in the charts, you can guess them. 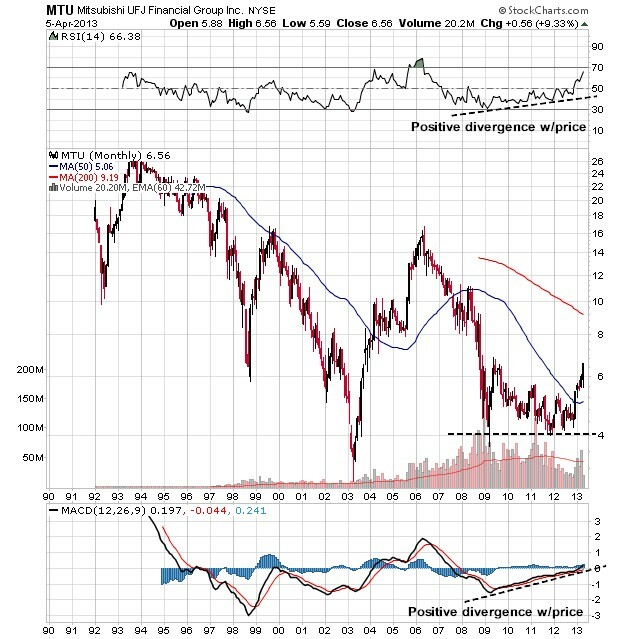 Top chart is gold and the bottom copper. I suggest to you it will be very important to monitor the health of US manufacturing ahead. A good chunk of forward consensus US corporate earnings expectations depend on it. In a forward discussion I’ll come back and look at US port statistics in an effort to further gauge the vibrancy of global trade, and by implication the health of US manufacturing. If the chart above of the Morgan cyclical versus consumer equities breaks the lows it rests upon, I suggest to you it will meaningfully call into question the hockey stick consensus US corporate earnings expectations for latter 2013 and into 2014. Oh well, I guess it’s a darn good thing the Fed has told us they may print even more money ahead. Stay tuned. One of the apparent conundrums of US Fed money printing in the current cycle is lack of headline inflation, at least as measured by the CPI. Certainly the CPI calculation itself is open to debate in terms of whether it is accurately depicting the cost of living in the US. But in bigger picture context, alongside quiescent headline CPI, the US credit markets have likewise not priced in meaningfully accelerating inflationary pressures. Although the very act of currency debasement academically connotes rising inflationary pressures, the US Fed has received a free pass in the current cycle so far as prior period predictions of a hyperinflationary fireball have fallen well short of the mark. Meaningful to global economic and financial market outcomes ahead will be the Bank of Japan monetary extravaganza of a generation that lies directly in front of us. Will Japan be so lucky as to have little to no headline inflationary impact while printing historic amounts of money? Or could it be different this time relative to the US monetary and inflationary experience of the last four to five years? Although not given much recognition amongst the high fiving over recent Japanese equity market levitation, there is one critical difference between the backdrop against which the Fed has operated compared to the landscape the BOJ faces. If we step back and take a bit of a bird’s eye view of the current cycle, a keynote fingerprint character point of Fed monetary policy is that it has played out in the direct aftermath of a US credit cycle bust. In terms of the timing and sequencing of potential cycles of inflation, this is important to keep in mind. In one sense what the Fed has sponsored with its own balance sheet growth has simply offset in magnitude balance sheet contraction in other sectors of the US economy, probably none more dramatic than the damage we’ve seen done to the asset backed markets over the last half decade. Key point being, the BOJ ahead will be operating in no such environment of immediate prior period credit contraction. The credit contraction, if you will, in Japan already occurred long ago. So if we think about Japan as a total system, BOJ money printing will be expanding the total balance sheet as there is no offsetting individual sector balance sheet contraction of consequence. As a bit of a visual proxy, let’s have a look at Japanese bank loans outstanding since the early 1990’s. Bank loan contraction bottomed eight years ago. 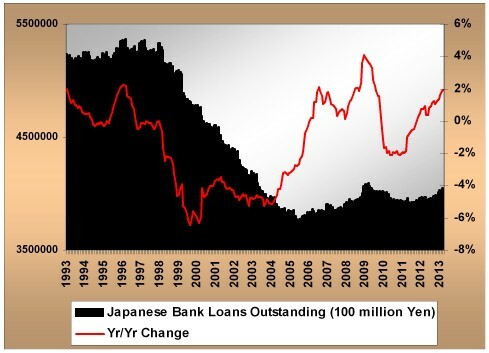 And as you can see, on a rate of change basis, year over year Japanese bank lending is in positive territory where it has spent precious little time if we look across a number of decades. As of the moment, the US and Japan find themselves in different credit cycle bust aftermath time sequences. And so we should expect similar inflationary outcomes under historic monetary policy experiments? I think not. Of course the second large and differentiating factor so far is relative currency movement. We all know what has happened to the Yen over the last five months. The US dollar never experienced this type of decline anywhere over the current 2009 to present cycle. Bottom line being, we should not be surprised to see a quite different outcome with inflationary pressures in Japan than has been the recent case in the US under similar monetary extremes. A few final comments. First, nominal inflation would really pick up in Japan if economic acceleration accompanied by meaningful wage gains were realized. This remains an open question mark on both fronts. Political leadership has advocated for higher wages in Japan, but corporate profit margins will be the ultimate determinant. On the economic front we are already seeing fallout from BOJ policy not necessarily favorable. Much as has been the case with US Fed actions for years, investors have already been trying to “front run” the BOJ. With the announcement from the BOJ targeting the lengthening of balance sheet asset maturities, investors bought long maturity JGB paper funded with sales of short maturity paper. This modestly drove down longer maturity rates, but drove shorter term yields up. Lending rates in Japan are keyed off of shorter maturity (two and five year) yield levels, so this is not a plus for lending, and by implication economic expansion. It’s more a prescription for stagflation. Finally, as investors we need to think about and monitor whether actions of the BOJ could transmit inflationary pressures globally, much as the actions of the US Fed have done, especially in emerging markets. We already know financial asset inflation, especially stock prices, is a key target of BOJ policy. Without question, additional Japanese capital moving out of the Yen will impact global equities. But credit markets are the key watch point as they will price in potential accelerating inflationary pressures long before equities. In the US, it’s the TIPS implied inflation breakeven rates that I continue to monitor. The US Fed began its latest round of monetary largesse at the highest implied breakeven rates of the current cycle. We’re just not that far from breaking out to “new highs” not only for the current cycle, but for the prior decade. For now, the grand monetary experiment continues. We simply need to be careful of the high level of complacency that has grown up around the impact of monetary policy on inflationary pressures in developed economies. The impact of BOJ actions will be global in nature as well as unprecedented. Stay tuned. JAPAN: Have They Pulled It Off, Or Pulled The Pin? We’ve seen quite the change in the Japanese stock market since the election of Prime Minister Abe last November. Accompanying the impressive stock rally we’ve seen change in the Japanese political line up with the new Abe regime and importantly, new Bank Of Japan leadership. The Japanese have now joined the global central banking chorus of “whatever it takes” (in terms of money printing to stimulate their economy). And like their global central banking brethren, they have been perceptually rewarded short term with gratuitous financial asset reflation. In one sense, what is occurring is a real game changer for Japan. Question being, a positive or somewhat darker game changer? That question remains to be answered. What I hope is important in terms of thinking about the reality of change in Japan is looking beyond the obvious money printing anticipation and global institutional underweight driven stock levitation act of the moment. From a secular perspective, that’s short term noise. Can Japan really pull it off this time? Or will they potentially pull the proverbial pin on themselves? Remember that this is not Shinzo Abe’s first time at bat as Japanese Prime Minister. When he first took office in September of 2006, the Nikkei rallied for five straight months, albeit not with the power or from the price depths of the current rally. The global economy at the time was also a different place with Japan’s largest trading partner China still rapidly accelerating, the US still in the midst of a real estate/credit cycle boom, and not a hint of smoke yet rising from the European periphery. Abe now embarks on his current policy adventure without the support of a global economy firing on all cylinders. Maybe this is all the more reason for what appears relatively radical monetary policy planning. We found out the key points of BOJ policy last week from newly appointed BOJ chief Kuroda. The BOJ is targeting a 2% inflation rate within two years, a doubling of the monetary base (this is very meaningful), a doubling of JGB maturity purchases, a doubling of BOJ purchases of ETFs (equity indices) and REITs, and a commitment to a 7 trillion yen monthly purchase rate. This is clearly the most aggressive Japanese QE policy on record since 1990. We have already seen some evidence of increased short term household spending domestically as clearly citizens are aware of potential monetary policy and currency volatility outcomes. And like experience in many other countries, financial asset levitation has been dramatic at the outset. Although late by about five days, the Nikkei hit 13,000 last week – the exact price political decision makers verbally suggested they wanted to see a month and a half back. 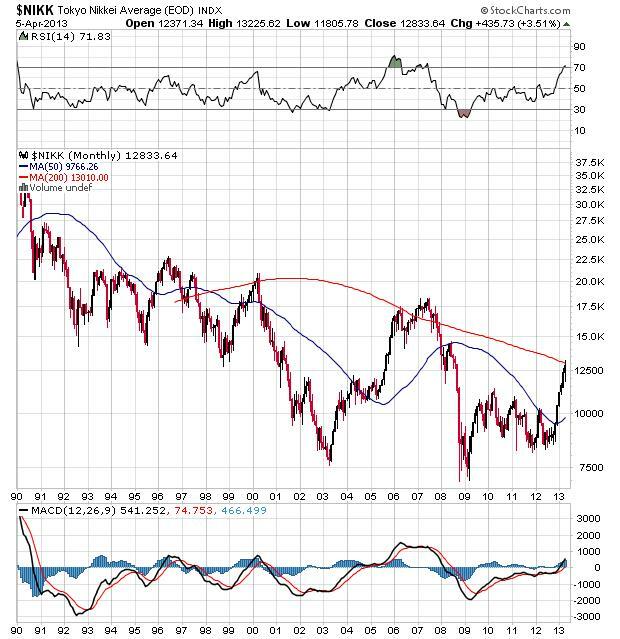 Key technical issue being near 13,000, the Nikkei has once again encountered its 200 month moving average. The 200 month MA has been meaningful upside resistance for the secular Nikkei bear for close to 15 years now. IF we are looking at positive fundamental change for the better in Japan and the equity market is correctly anticipating such an outcome, that key technical demarcation line needs to be taken out decisively to the upside. It’s probably the spot where we get a bit of volatility and testing short term. But as we all know, the transmission mechanism of monetary policy into real economies in the global economic environment of the moment has been problematic up to this point. Central bankers have shown us they know how to reflate the price of financial and in some cases hard assets. But their fundamental impact on real economic activity and direction unfortunately still leaves a whole lot to be desired. For now, the difference for Japan singularly is an apparent strong commitment on the part of the BOJ to remain aggressive, unlike prior BOJ monetary policy excursions. So what do we look for in Japan in terms of trying to gauge whether Abe and BOJ monetary policy plans will positively impact the secular trend of the Japanese economy? Can they really pull it off this time? Again, the lesson of the last four years appears clear. Monetary policy can move the asset price needle for a time, but has had much less impact on the fundamental reality of individual economies. Why has this been the case? Although it’s just my personal opinion, if we look at the experience of Europe and the US just what has been lacking? Reform. Europe has thrown pieces of money at hotly burning short term financial/economic/banking system fires mostly in peripheral countries, but has done absolutely zero to reform the key infrastructure of the Euro system itself. In like manner, the US has done nothing to reform the TBTF financial sector 800 pound gorilla’s as their ever expanding girth remains a key systemic issue. Reform of debt, deficit and entitlements at the government level stateside? The sequestration is lip service compared to what is actually needed and will ultimately be accomplished one way or the other. Key issues of reform avoided….for now. Is this the reason why achieving economic “escape velocity” has been so elusive? So as we look at Japan I would suggest to you that beyond money printing and the global institutional investment underweight in Japanese equities impacting current price, real fundamental economic change in Japan will come with reform and deregulation. This is what would turn a momentum rally into perhaps the beginnings of a longer term bull market. 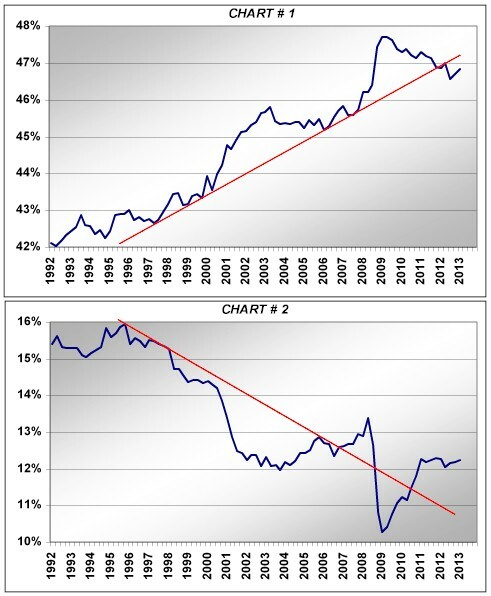 Money printing can certainly gin up stock prices, but sustained economic change must be driven by reform. This is where the Abe rubber will meet the road. Although this is an incredibly short and certainly incomplete list, what needs to be done? Corporate tax reform. The stimulation of business fixed investment. True change in constricting labor rules and regulations (is there an echo in here from France?). The opening of markets to foreign investment and competition. Reform in immigration policy as Japan’s demographic issues still loom large. The rally in the Nikkei up to this point has certainly been fun, but attacking and successfully navigating these issues of needed fundamental economic reform will not be accomplished in such linear fashion. There will be bumps in the road, as is the case in any environment of true fundamental change. In addition to fundamental economic reform, the Japanese corporate sector must also act to become more shareholder oriented in terms of capital allocation. The quality and action of corporate governance is key here. M&A focused at least in part on productivity, share buybacks and increased dividends would all play a part at the margin in a potential rerating of Japanese equities relative to global equity valuation metrics. Does Japan have the potential to break the chains of its multi-decade economic malaise? Indeed it does, as do its developed economy brethren. True fundamental economic reform is the key. The political will to print money is an easy one, but the heavy lifting of true economic reform is another story all together, exactly as we’ve witnessed in the US and Europe so far into the current cycle. The risk, of course, for Japan, is monetary debasement in the absence of true fundamental reform. We’ve seen the Yen weaken meaningfully since last October and that has clearly sent Yen based capital in motion globally. We’ve seen a very meaningful increase in short term JGB price volatility, as witnessed relatively dramatically last week. In the absence of true reform, I suspect we’ve only seen the beginnings of Yen based capital flight globally, which of course has ramifications for global asset markets. There is no question in my mind that Abe and the BOJ are not acting in isolation. They’ve clearly received the blessing of the US. Remember the swaps Bernanke arranged for the Euro community a few years back? You can bet there are a few tricks up central banker sleeves to attempt to quell any type of market dislocations ahead. But again, coordinated central bank actions can really only influence the short term. The long term is all about the reflection of fundamental reality. In one sense, stop watching the Nikkei and start watching for real change and reform in Japanese domestic economic policy, none of which was discussed by the BOJ last week. I’ll leave you with one last and perhaps too simplistic thought. Historically, true equity bull markets correctly anticipating economic cycle acceleration have often been led by financial stocks. That’s one thing that has not been seen in the US and Europe over the current cycle, of course suggesting the underpinnings of the cycle are unlike historical experience. 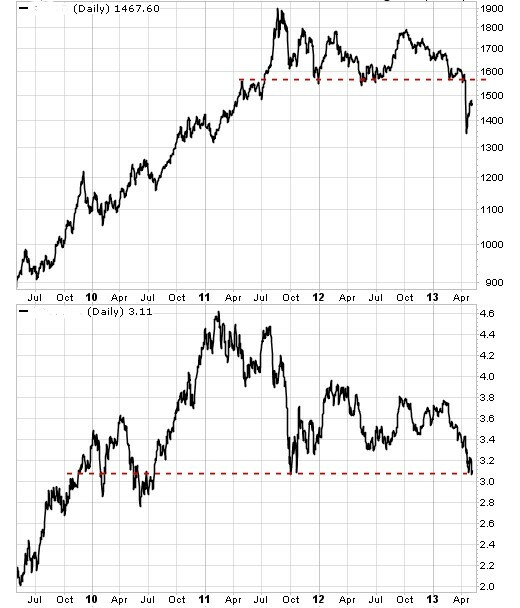 In Japan, two lead financial sector sled dogs are Nomura and Mitsubishi Financial, whose charts are seen below. 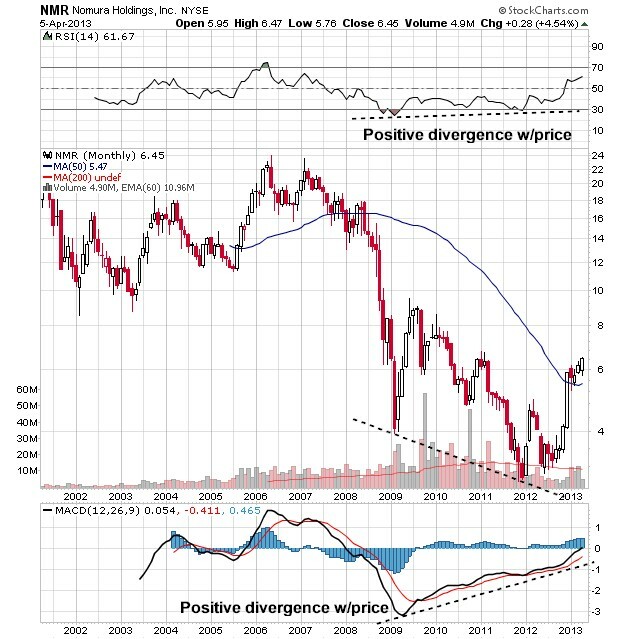 Interestingly, we see a positive divergence on the monthly charts between price action and both the RSI and MACD measures over the entire 2009 to present cycle. Admittedly we saw this same technical set up for Mitsubishi in the early part of the last decade. They have certainly dutifully rallied along with the Nikkei, but if we are even close to seeing the beginnings of true secular change in Japan that necessarily must be accompanied by real reform, these two are just getting started. Stay tuned.